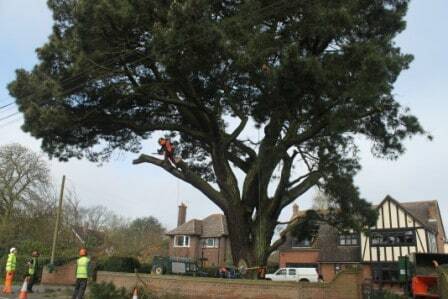 We had a request for a quote to remove a very large Corsican pine tree in Tiptree, Essex. The tree was over 20m tall and the trunk more than 2m thick. The tree was growing right next to a busy main road and over the past two years several branches had fallen off onto the highway below. Due to the size of the tree the roots had also spread under the garden wall causing cracks and making it unsafe for passers by. In addition the roots had lifted the footpath up in several places. 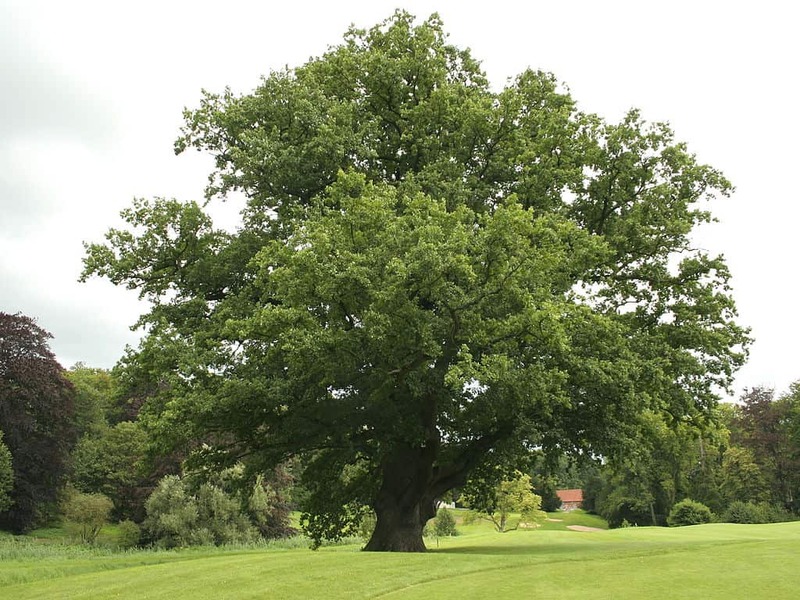 It also emerged that our client had experienced several near collisions upon exiting his property due to the layout of the driveway to accommodate the tree. 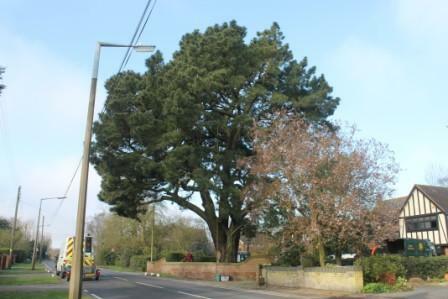 We submitted our quotation and checked with Colchester Council to ensure the tree wasn’t subject to a Tree Preservation Order. Our quote was accepted, in part due to the detailed risk assessments that we had prepared. The job itself took 4 days. 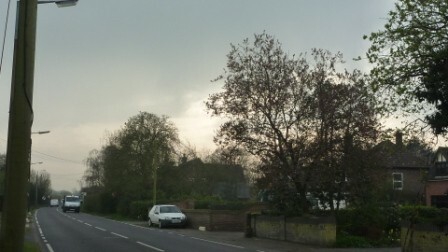 The first day we hired in traffic lights to provide a safe working area while we removed the branches overhanging the road. These all had to be lowered one by one using rigging equipment as nothing could be dropped directly onto the road. It took two days to completely remove the crown which produced 8 tonnes of wood chip which was returned to our yard for biomass recycling. 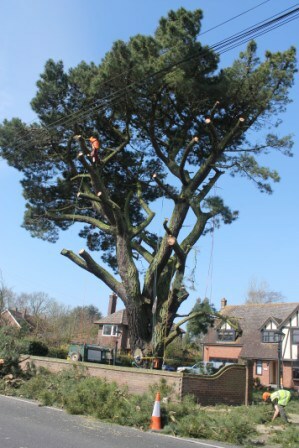 We then dismantled the remainder of the limbs using our rigging equipment which enabled us to remove up to 600kg at once in a controlled and safe manner. 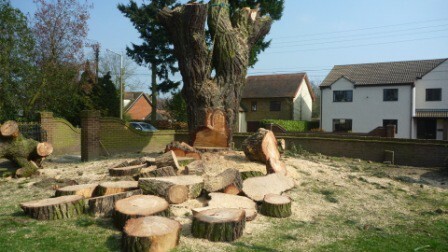 This left the trunk at 6m high and approximately 8 tonnes in weight. 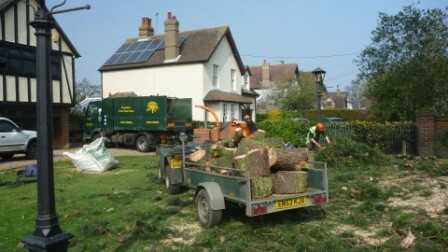 We laid out the rings of wood from the large branches to make a cushioned platform for the trunk to fall onto so as to protect the lawn. We then carried out a winch assisted fell of the trunk using our winch equipped landrover. The trunk was over 2 metres in diameter which we easily cut into rings using our monster chainsaw which has a 1.2 m cutting width – this is the largest chainsaw you can buy. 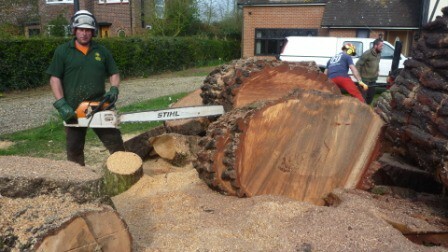 However, these rings still weighed 200kg each which we then split into more manageable pieces using our 25 tonne hydraulic log splitter. All 38 tonnes of this processed wood was moved and stacked in the client’s woodshed 200m away using our quad bike and dedicated wood trailer. 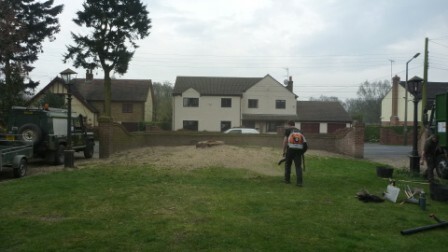 The site was then left tidy in preparation for stump removal. This job would not have been possible without the correct equipment and skill of properly trained arborists.